r a d i o --- s a t e l l i t e --- s t r e a m i n g --- b r e a k f a s t --- d i n n e r --- p a r t i e s --- c a k e !!! Times and live links will be on the UpStage web site. http://nomadinenakatemia.blogspot.com will arrange a gathering January 17, 5 pm in Harakka island, Helsinki. bringing together the human and machine sounds in leaking bordering surfaces and in varying contexts. The evening is dedicated to Risto Heikinheimo (1955-2010/11), painter and performance artist. produced by Czech Radio and the EBU will be taking place within the global conceptual celebration of Art�s Birthday 2011. Venue: The Gallery of the National Technical Library, Prague. in many European Cities from January 17, 7 pm - 11 pm! In the inner circle of KunstvereinGRAZ, located in Regensburg, Germany, we celebrate art's birthday. Each member and invited guest will prepare a gift for art, which will be sent to the world wide web. Also a small video-programme will be shown. With best regards: Renate Christin and Andreas M�ller. play sounds or have fun with us for the two hours we are on air. Exceptional birthday songs and sounds for the 1,000,048th birthday of art are more than welcome! Most museums in Belgium are close don Monday�s. Also MUHKA ( Museum for contemporary art of Antwerp ) is closed on a Monday. in the world on ARTS BIRTDHAY with free entrance for all visitors. ARTS BIRTDHAY 2011 is a live mix as a soundscape of museum sounds and the repetitive reading of open / closing times from all over the world. As a special present for Art, a special edition of OKNO's monthly Pure Data Patching Circle. Use PD to process, redirect, connect, crash and reconnect the data in realtime. Join in. A present is a present, and surprises are the best, long live Art! Graffiti; Followed by the making of a magazine with Steven Paige; Plus Live music. Monday 17th - Launch of the "Three Year, Four Day Working Week" with an online radio broadcast. Carlos Santos, Jo�o Vasco Paiva, Ricardo Reis, Rinus Van Aleebek, Andr� Avel�s, Gon�alo Alegria, Lull Cec, and more. in the context of "ignorance of the law (is no excuse)". Thanks, Art!!! cake contest, dance party and ringing in of art's birthday @ l'Envers, 185 van horne, montreal! January 15, 5 pm to January 18, 5 am Receive�>transform�>send Birthday performances TBA. on Monday, January 17, featuring experimental broadcasts and highlights from celebratory live streams around the world. January 18, 12 am to 3 am, at The Artel, 205 Sydenham St.
Cake contest with celebrity judges and artprizes! Performances by Decomposing Pianos! 101.9FM Kingston ON, streaming link at http://www.cfrc.ca. course there is cake! Happy One Million and Forty-Eighth Birthday, Art! Albuquerque-based composer Christian Pinock http://www.christianpincock.net/experimental/index.htm performs original improvised compositions on electric valve trombone. Argentinian composer, clarinetist, and alto-saxophonist Guillermo Gregorio resides in Chicago, and performed with Fluxus-like Movimiento M�sica M�s in the 60s. 2011 Winnipeg! Video Pool Media Arts Centre  presents!! When:  January 16, 2 am   doors open 8pm. $10.00, or $8.00 with costume. Top Ten videos for 2010  from Video Pool begins promptly 8:30pm. January 16, 1 am - 7 am, EMMEDIA/QAS Building - 351 11 Ave S.W., Calgary, Alberta, Admission is FREE! Fillou ACAD Sculpture 316 w/ Rita McKeough and many others! For more information, visit us at our website. A night of hair raising fashion meets music. WORLDWIDE premiere of sound and artwork streaming live Sunday January 16, 5 pm. We have cameras, glockenspiels, tambourines, harps, sponges, oranges and blueberries. "The Silent Speaker" - a generative stream for Art's Birthday. January 16, 8 pm to January 18, 8 pm. 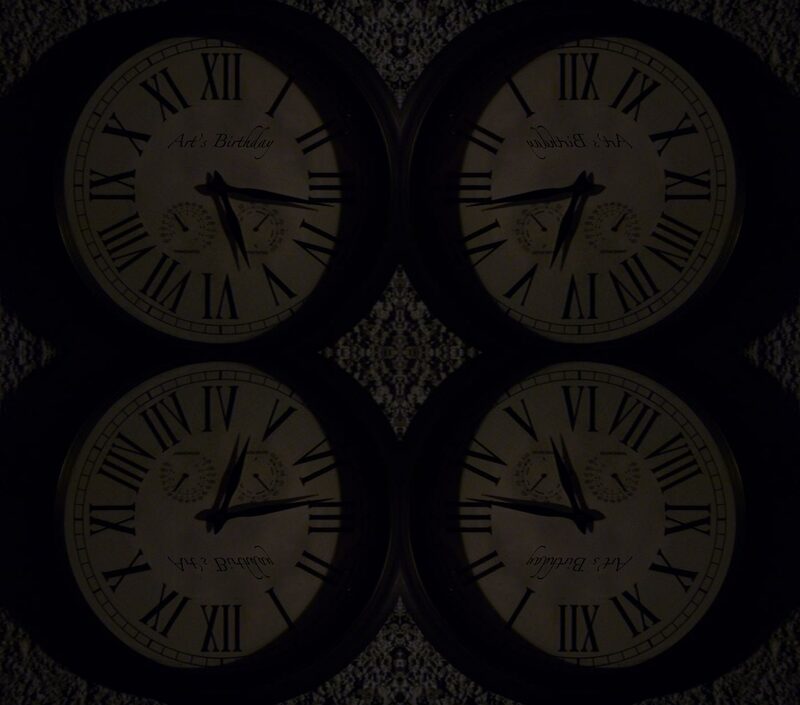 "The Counter-Clock World" in which time moves in reverse and the cycle of life runs backwards. Noise, performance and experimental music featuring Ross Birdwise and Soressa Gardner, Baskets and Quantum Dots. January 17, 4 am to 7 am at 303 East 8th Avenue, Vancouver, BC. We believe that life itself is a work of art, and thus, it should be celebrated as often as possible. On the vigil of Art�s Birthday, let�s walk with flowers. Everbody can participate! The idea of this event is to be friendly to strangers and interact with them - for a couple of seconds, minutes, or even hours. More information on the Walk With Flowers Day. January 16, 5 am to 4:59 am, worldwide.